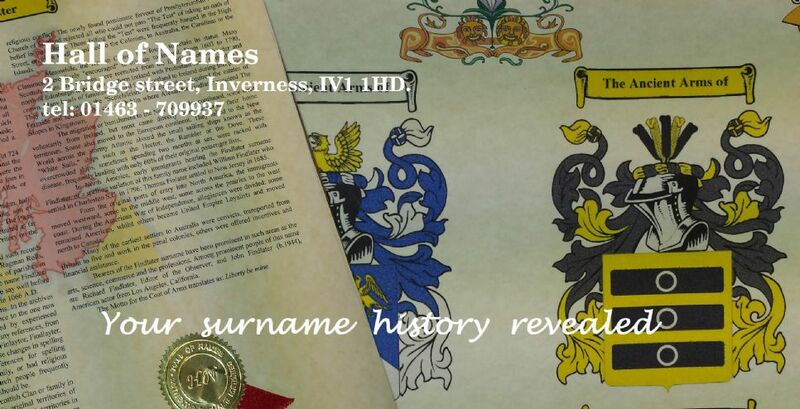 Hall of Names - Inverness provides historical and heraldic gifts such as Coats of Arms and Surname Histories as part of its exclusive, personalised product range which are designed to last a lifetime. Our product range includes family tree templates, most European name historys, coat of arms shields and surname family crests. Let us search our extensive data for your surname, its origins and meanings. Where did your family name came from. With our extensively researched database holding over 1,000,000 Coats of Arms and 1800 word Surname Histories, origins and meanings we guarantee the most informative and accurate data about your name on our most popular product- personalised scrolls. Each scroll is backed by the Hall of names -europe seal of authenticity. Each named essay is printed on A3 acid free parchment paper using non fade pigment inks to ensure that the scroll will be just as beautiful for future generations as it is for you, today.